Velcom Review 2019: Is Velcom a Good Hosting? Velcom is a performer in the areas of security, scalability, speed, and operational control. Their robust offerings, low prices, and ability to handle unexpected traffic spikes make them an excellent choice for both small and large businesses. In operation since 2002, Canada-based Velcom offers a range of affordable web hosting packages that suit both beginners and experts. Velcom’s service offerings include virtual (shared) hosting, reseller hosting, VPS hosting, dedicated servers, and colocation services. Their website is in English, but they support up to 26 languages. Their basic plans provide more substantial functionalities than the basic plans offered by most other providers. What’s more, the one-click installer and website builder make Velcom very beginner-friendly. I particularly like the way Velcom places emphasis on scalability, by making it easy to switch between plans at any time. This is especially useful if you want more add-on domains, a dedicated private IP, or private SSL certificate. You’ll have to look elsewhere if you want to host on the Windows operating system since they only support the CentOs Linux distribution, which gives you access to phpMyAdmin and MySQL via cPanel. Weekly backups are automatic, but you can also back up your files manually at any time. Velcom’s pricing sits at the industry average. It is a good deal when you consider the features they offer, but you have to sign up for a minimum of 36 months to secure the best pricing option. At the other end of the commitment spectrum, you could pay for just a month if you’re not sure that this provider is for you, and take advantage of the longer-than-average 45-day money-back guarantee. Velcom has a toll-free support contact number, but this is available only if you subscribe to their “All Set” plan. Otherwise, you can summon support via their support ticket system, email, or live chat. I was pleased to receive a live chat response within 20 seconds. If you prefer to help yourself, you’ll be disappointed with the empty knowledge base that is arguably worse than no knowledge base at all. Velcom’s strongest points are its reliability (even during traffic bursts) and the ease of scaling your servers at any time. Their pricing plans and contract conditions are not as stringent as comparable providers, and their services are suitable for both beginners and experts. 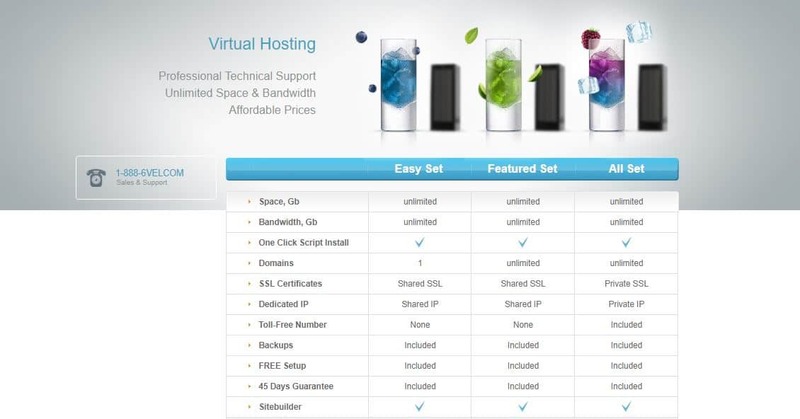 Wondering how Velcom stacks up against other Web Hosting companies? Enter any other Web Hosting company and we will give you a side-by-side comparison.